Prior to the race, all the talk concerned 2015 Gold Cup winner Coneygree and the ever-popular Cue Card but neither horse managed to finish. Coneygree made an error at the third fence and jumped erratically after that, while Cue Card had just moved into contention on the second circuit when he took a crashing fall. Coneygree's jockey Nico De Boinville and Paddy Brennan on Cue Card were inclined to blame the low sun. 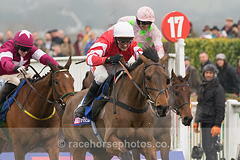 Both horses were sound, apart from an overreach to Coneygree. Bristol De Mai (6-1) was always travelling sweetly for Daryl Jacob in the soft ground he loves but he had to fight hard with a 6lb penalty to see off Blaklion by half a length. Definitly Red was beaten a long way back in third. The Naunton handler, who was winning the Charlie Hall for a record fifth time, said: "Bristol De Mai doesn't turn seven for a few weeks so he should be coming into his own this season, which is amazing given what he has already achieved. 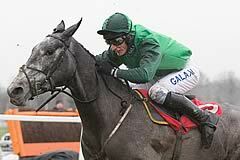 "It will be the Betfair (Chase, Haydock) next for him. He should get his soft ground and he likes it there. "He was always travelling and I was just very happy with him. "Blaklion pleased me, too. He was getting 6lb so the handicapper shouldn't be putting him up. "That should leave him spot-on for the Becher Chase (Aintree)." Jacob received a two-day whip ban (November 18-19) for not giving his mount time to respond. The dates coincide with Cheltenham's BetVictor Gold Cup meeting but he can ask to serve the ban on other days. Connections of Coneygree were left dejected by the injury-plagued chaser's latest setback. Assistant trainer Sara Bradstock said: "He simply frightened himself at the ditch. He doesn't do that normally and after that Nico said he was just scared. "He pulled him up because he simply wasn't jumping like he normally does and he wasn't going to win. He is the best jumper in the world normally so something wasn't right. "Thankfully he seems fine, he's got a little cut but nothing serious. "Nico said the sun was very bright and it might be that he didn't see the fence. "We'll go back to the drawing board now and try and get schooling him on the grass. We've only been able to do it on the all-weather up to now." Colin Tizzard reported Cue Card to be none the worse for his fall. He said: "He's OK, that's the main thing, and so is Paddy (Brennan). "He moved upsides just as the real race was starting and he just got it all wrong, which he has done in the past." Brennan added: "He couldn't see the fence. He just took his eye off it and at this level you can't do that. "The further he went the better he travelled but early on he wasn't enjoying the ground so I rushed him up and then got there a bit sooner than I wanted."